Rome, Jan 4 : An Italian trade union has urged the government to intervene after India cancelled a $770 million (Rs. 3,600 crore) helicopter deal hit by corruption allegations. In a statement, the Fim-Cisl union's national coordinator Paolo Carini said Friday that Rome must "roll out a diplomatic initiative towards the Indian government on an issue that has been dragging on for many months". 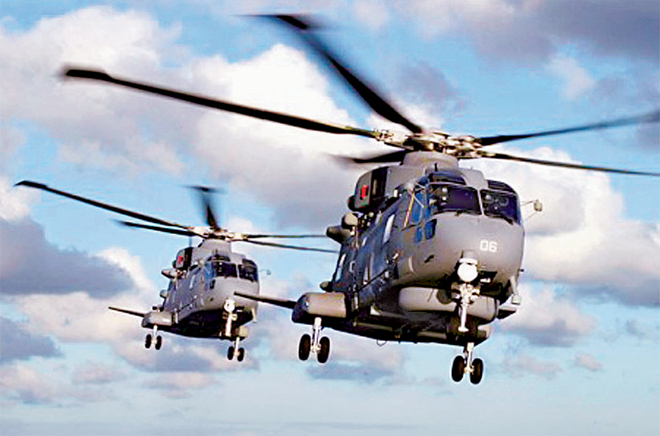 India Wednesday terminated the deal with AgustaWestland - the British subsidiary of Italian defence major Finmeccanica - more than a year after reports claimed that two top officials of the company allegedly paid bribes to bag the contract for the chopper maker. "India's latest decision could seriously jeopardise AgustaWestland's industrial, employment and economic prospects," Carini said. The division employs more than 6,000 people in Italy and 12,000 worldwide, Carini said. The Italian treasury is the main shareholder in Finmeccanica, which wholly owns AgustaWestland and cannot "exempt itself" from "a serious problem affecting Italy's main industrial group", Carini added. Finmeccanica has warned the cancellation of the deal could lead to job cuts. Three out of the 12 AW-101 helicopters were supplied to the Indian government in December 2012, and three more were due to be delivered. In a statement Thursday, Finmeccanica said it remained "committed to perform the remaining obligations under the agreement" and would support the helicopters operated by the Indian Air Force. Finmeccanica added that it was ready to introduce a "mitigation plan", which includes labour force cuts and "the reallocation of existing working capital", without giving further details. It said it had introduced "stringent ethical procedures common to all Group companies" that were "reviewed regularly". "AgustaWestland applies the same strict procedures to prevent corruption in accordance with the updated Finmeccanica policies," it said. Finmeccanica's former chief executive Giuseppe Orsi and Bruno Spagnoli, CEO of Finmeccanica's helicopter division AgustaWestland are on trial for corruption and fraud over the chopper deal with India.